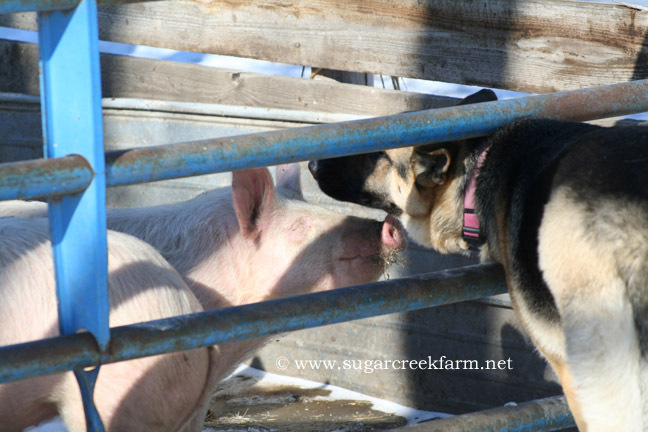 Ava surely loves her pigs. And I mean luuuurves them. She trots up to the gate to see what they’re up to. And they come up to greet her. Anybody have good resources to recommend for training GSD’s for herding? She has the desire, but doesn’t know what to do and usually just chases things willy-nilly in a most unhelpful manner. At that point Matt usually threatens to shoot her. But the other day she followed Matt into the cattle pen, when some of the calves had broken in with the cows and needed sorted back out. Ava herded the bull and cows away from the calves and, just as importantly, stopped when Matt called her off. So now he’s thinking there’s hope for her as a herding dog and wants to work on training her. Email or leave a comment if you have suggestions. Thanks! Try roping milk jugs together (approx. 2’spacing). If you can get her interested in the jugs she will corral the jugs to a circle. It’s just instinct. Years ago, I had a collie that I trained using this technique. We have a blue heeler that does the same thing. 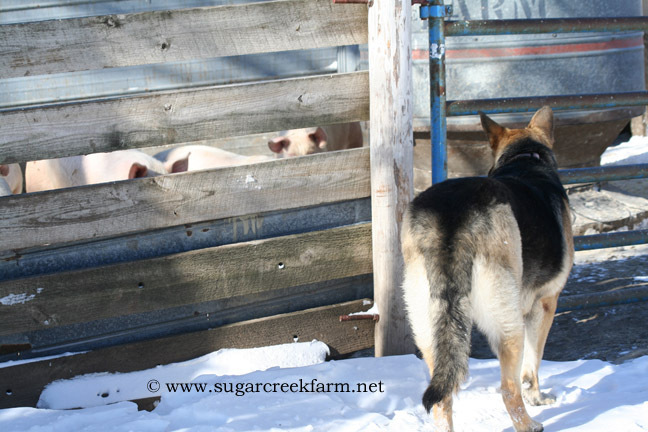 One day, our pigs got out and we went after them and grouped them together and walked em back in the gate they got out. Then next time, he just chased and began playing with him. Beginners luck I guess. I don’t know what it is about pigs but he loves them. Especially when its colder, I go out to the barn in the mornings and he is in there laying with them. I want a picture but he always gets up as I get there. Check with Walter Jefferies at Sugar Mtn Farm. He has a ton of info on his site about livestock guardian dogs and he trains his to do most of his work for him. I got a dvd called The Perfect Stockdog to try training my Australian Shepherd to herd. He also wants to herd, but desperately need direction. I have watched it a few times but haven’t done any work with the dog yet. The video quality is a little less than professional, but he shows the process of working with a dog from beginning to end. Mostly it seems like it is a lot of repitition with the dog on a leash and a few cows in the corral. I don’t know that I can recommend it or not recommend it as I haven’t put it to use yet, but the dog he is training (a border collie) 15 minutes a day for a month seemed to work pretty well by the end. The guy’s name is Ben Means. Fantastic pics! 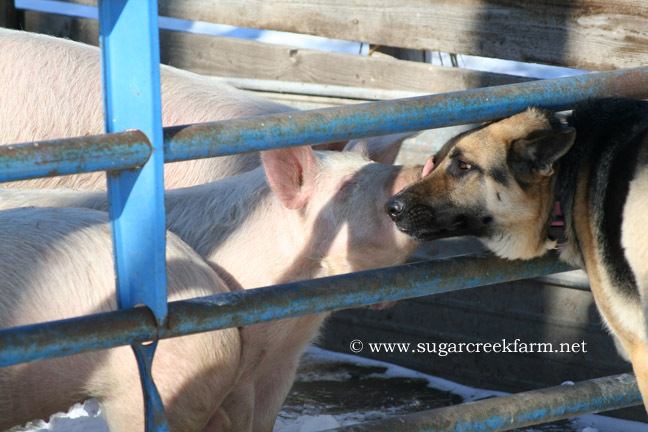 Adorable pooch and pigs, too!We love the GSD breed. We just bought a GSD puppy before Christmas. She is already trying to herd our 2 llamas, who really do have the patience of saints.They would normally anihilate any type of canine in their pasture.